1) Why do we have official "training" courses to begin with at our embassies in foreign countries? 2) Wouldn't journalism courses be more appropriately conducted at private universities and monies spent on "training" courses be better spent instead on actual scholarships for students to visit and attend our colleges? 3)Would we tolerate such "training" courses by foreign countries here in their embassies in the U.S? Why is it acceptable then for us to do it in other foreign countries? 4) One of the stumbling blocks to normalization is what activities the U.S. embassy in Havana would conduct with Cuban civil society. 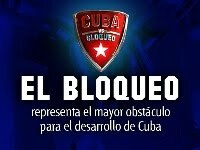 Similarly the Cuban embassy in Washington DC would conduct parallel activities with American society. What is appropriate then and what is not? That is what should be flushed out in black and white, in straightforward English and Spanish and put into writing, and respected by the parties. 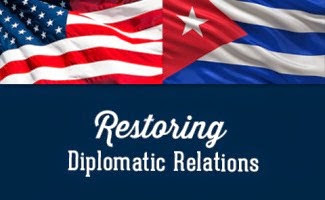 5) Would the monies being spent on so called "Democracy" programs be better spent instead in the creation of a United States Cuba Bank for Reconstruction and Reconciliation to promote American and Cuban investment and compensation for all parties affected by the U.S. Trade Embargo? Should embassies sponsor “training courses”? Imagine that Cuba finds a big deposit of commercial-quality oil, so big that it can cover domestic needs and even derive income from exports. Maybe it's enough to fund a series of training programs operating from the new embassy in Washington and dedicated to the self-improvement of young people in the U.S. The programs would cover four major areas, as follows. One of the programs would focus on human rights (condition of Indian reservations, treatment of black people by police, jails, massive domestic spying, unaffordable education and health care, homelessness, and so on). Another would discuss democracy versus oligarchy and plutocracy, covering aspects such as elections that are decided by the amounts of money involved, gerrymandering, rules meant to prevent voting, and the determination of interest groups including some from abroad. Also, special seminars would cover the Deep, or Phantom, State, including the national-security complex, the military-industrial complex, and high-level banks. A third would address the role of journalists and how to create news media that are independent of the government control exercised through intermediaries like the corporate boards of directors, managing editors, and lower-level editors – even the advertisers. That would include how to use news and social media to impact on national and world opinions. The fourth would prepare the participants for leadership, meaning how to organize against government levels according to particular demographic areas or social groups, with an eye to eventually bringing all of these together to face off against the national government at the right moment -- maybe even to bring it down. This training would be accompanied by a few benefits. In order to motivate participation in the courses, those chosen would be granted stipends. In addition, Cuba would invite selected students to travel to the island for periods of total immersion at advanced levels, taught by very experienced personnel. Of course, that would not preclude some R&R at the beaches or Havana nightclubs. The US would probably object to an educational series of this sort, and properly so. Embassies are for diplomacy, not for intervention in the internal affairs of other countries. Cuba could say, in the new spirit of reciprocity, "but you do things very much like this; why shouldn't we?" It's a simple question. The answer would not be as simple.